When you marble, layer, and swirl doughs, batters, toppings, or frostings, good looks and good taste come together in one total package. Irvin Lin, creator of the popular blog Eat the Love, shows how these techniques open the door to inventive flavor combinations that look as fantastic as they taste. These more than 150 recipes range from brownies and bars to muffins and morning buns to show-stopping cakes and tarts: cinnamon spiral icebox cookies, pistachio-swirl brownies, triple-chocolate pie, multicolored "Neapolitan" layer cake, and more. 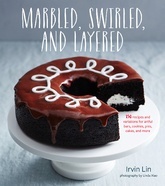 Lin offers variations to suit any taste, plus baking and decorating tips throughout. These exquisite creations will dazzle you at first glanceï¿½and then again at first bite. Color photos.